(Hibis-cus: ancient Greek and Latin name, syri-acus: Syrian) Hibiscus Blue Chiffon is the latest addition to the Chiffon series from breeder Dr. Roderick Woods of England. The exquisite blue flowers have a lacy center of lighter lavender-blue petals that give it a semi-double appearance. The flower centers are accented with wine red color that streaks out from the veins of the petals. 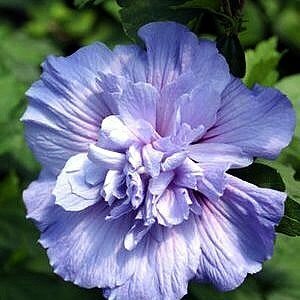 Hibiscus Blue Chiffon blooms profusely from July through September.